Welcome to 2019! A new year represents a fresh start, and what better way to start out than getting those pesky dents out of your car? 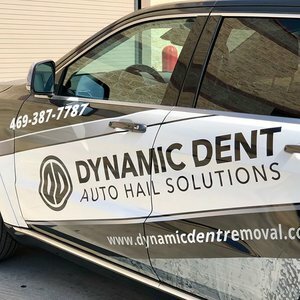 Dynamic Dent Auto Hail Solutions, located in Lewisville, Texas, is your go-to repair shop for collision repair and hail damaged vehicles. It does not matter how your vehicle got the dent, Dynamic Dent is here to get it out! Our process of Paintless Dent Repair (PDR) can repair any dent related damage on your vehicle. Did you sit through hail recently? Did you endure a recent fender bender? Did a shopping cart hit your vehicle? Our highly trained PDR technicians will use a set of unique tools that are specifically designed to access dents from the backside of the metal panel. After they access the panel, the technician will slowly massage and push to reshape the dent and restore it to its pre-damaged condition. If the work is done by an expert, no matter how big or small the dent is, it can be restored entirely. The process of PDR in no way harms your vehicle’s factory finish, maintaining your vehicle’s value. PDR is also usually much quicker than a typical body repair shop, getting you on your way faster without compromising quality of work. Dynamic Dent is locally owned and family operated, and we work with all insurance companies. A rental car will be provided by your insurance, or us, at no cost. Repairs are guaranteed to be fully covered by your insurance, no out of pocket cost on approved claims with discounts, your insurance rates will not increase for a hail damage claim, and hail repairs are not reported to CarFax.